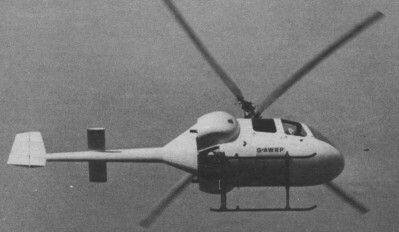 J.Weir maintained a working association with J.S.Shapiro, and in 1961-63 Servotec built a man-carrying helicopter model to embody Weir's ideas of a non-stalling rotor, which emerged from many years of model tests. In the course of this collaboration, Weir became aware of the CR Twin development and in 1965 decided to give this development financial support. This combination of interests was cemented in a take-over of Rotorcraft Ltd by the Cierva Autogiro Co, which was thereupon renamed the Cierva Rotorcraft Co. The largest shareholders were Weir and Shapiro. 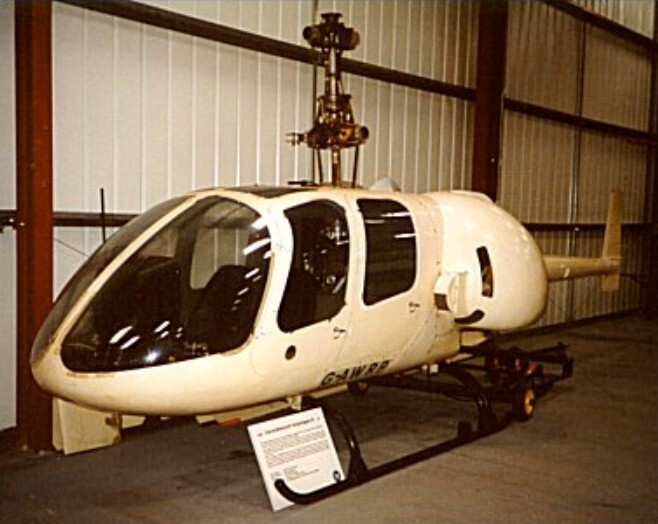 The design for a four-seat helicopter was shaping up during 1965, and in 1967 the Ministry of Technology awarded a research contract as a partial contribution to test some novel features. Also in 1967 construction of the prototype began, and the first flight took place in August 1969. In the same year Servotec Ltd was taken over by Cierva Rotorcraft Ltd. Servotec, with its design and inspection approval, continues development work on the CR Twin helicopter and also work under contract to several organisations, including Canadair, Boeing-Vertol and Bell. The CR Twin retains the basic layout of two engines driving two contra-rotating coaxial rotors, as this was considered to be the only configuration in which the aims of twin-engined safety, simplicity and efficiency could be attained at a low first cost. When the aircraft was designed the only means of achieving the desired performance at a low cost was by the use of piston engines. The turbine engines then available, and indeed still available several years later, were too costly, required a further reduction stage in the main gearbox and had an excessive fuel con-sumption in cruise. Two prototypes were built, using Rolls-Royce Continental O-300 engines of a nominal 145 bhp each. Designated CR.LTH-1 (otherwise known as the CR-Twin) and the first aircraft, G-AWRP, first flew in 1969 followed by G-AXFM (GB-2) later that year, and a third pre-production machine, G-AZAU (GB-3) in mid-1971. This latter aircraft was fitted with 210hp Continental IO-360-D engines, and the production variants were to be the CR.420 with 210hp Continental TSIO-360-A engines and the CR.640 with 320hp Continental Tiara T6-320 engines. These aircraft were used to demonstrate the practicability of the rotor and airframe, but the lower engine power actually available was inadequate to permit single-engined flying. Test flights showed that the low-speed handling was easier than with conventional helicopters (having a single main rotor and an anti-torque rotor). No difficulties were encountered when engaging rotors in wind speeds up to 35kt. Adequate yaw control was available for normal helicopter manoeuvres, and no control difficulties were met in side-ways flight at 25kt or in quick stops. A maximum speed of 90kt IAS was attained using less than maximum power, and full autorotation was achieved. The first pre-production CR Twin was under construction in Servotec's workshops at Redhill in 1972. For its initial flight trials this aircraft was to be fitted with normally aspirated Rolls-Royce Continental IO-360s of 210 bhp each. An extremely simple mechanical layout was chosen for the CR Twin. The engines are mounted at about 400 to the fore-and-aft axis, each driving into the main gearbox through a short drive shaft and combined centrifugal clutch and free-wheel unit. A single-stage-reduction main gearbox is used, comprising only two input pinions and two output crown wheels the upper of which drives the lower rotor and the lower the upper rotor. The engines, gearbox and rotors are mounted as a combined power/lift group in a separate tubular sub-frame. The rotor is controlled manually by the pilot with no servo assistance being provided. The blades are of a symmetrical untwisted section so that the same spare rotor blade can be fitted to either the upper or the lower rotor, should a blade be damaged in service. Each main rotor blade has a hollow main spar of "compressed wood," a plastic material reinforced with wood fibres, to the leading edge of which is bonded a stainless-steel anti-erosion strip and within which nose-balance weights are fitted. A blade carcass of glass-fibre cloth of increased thickness towards the blade root is bonded to the main spar aft of the erosion strip, and is injected with polyurethane foam in order to stabilise the trailing-edge section. The canopy, cowlings, Tail-cone and fairways are all constructed of glass-fibre and are mounted on a simple light-alloy platform that also provides mountings for the undercarriage, the subframe supporting the complete power-lift group, the controls, fuel system and instruments. A feature of the helicopter is the ease with which the canopy, cowlings and tail cone can all be quickly removed in order to simplify major servicing operations. The design has followed the sealed-maintenance concept by which field unit assemblies can be exchanged quickly without exceptional skill or facilities. Development was eventually abandoned in 1975 due to lack of further financial backing. 2 x Continental TSIO-360A, 210 h.p. Fuel cap: 65 Imp gal (295 lt). Baggage capacity (rear fuselage): 16 cu ft, 0.453 cu.m, (rear cabin), 47 cu.ft, (1.34cu.m). 2 x Continental Tiara T6-320, 320 h.p.